Two studies on building a better pre-school caught my eye this week. On the front page of the Wednesday, May 31, 2017 New York Times, education reporter Dana Goldstein details the findings of a group of researchers out of the University of California, Berkeley looking at the role of academics in pre-school, while Robert Wood Johnson Foundation/Penn State have just released a brief focused on the importance of social and emotional learning in pre-school. I would like to look at both studies to see what conclusions we can reach when working to create the best possible pre-school environment for children. The Berkeley study is sure to kick up a lot of fuss, first because it appeared on the front page of the New York Times, but also because it flies in the face of what many parents and teachers see as the optimal pre-school environment. The title of the piece doesn't help, Free Play or Flash Cards? New Study Nods to More Rigorous Preschools. Reading the article and the research report shows that the researchers' report is much more nuanced than a flash cards vs. play dynamic. 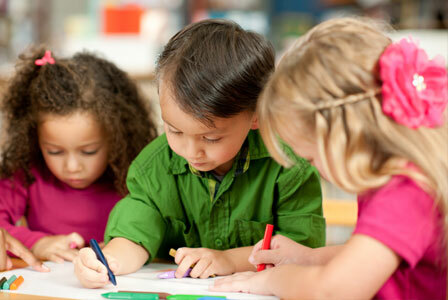 What the researchers found is that children in academically oriented pre-school classrooms, which included activities focusing on oral language, pre-literacy, and math concepts, made academic gains that advantaged them as they entered kindergarten and throughout the kindergarten year. At the same time, and just as importantly, the authors found that this academic orientation did not have a negative impact on the social, emotional growth of the children. The Robert Wood Johnson/Penn State brief concludes that to "promote school readiness, preschools need to focus strategically on social-emotional development." A focus on social emotional development pays off in greater readiness for kindergarten and with a wide array of positive adult outcomes from better interpersonal relationships to productive employment to civic engagement. The brief says that schools should be encouraged to use "evidence-based" programs combined with integration into academic enrichment programs and professional development for teachers in implementing the programs. So what is the educator to do with these two seemingly competing orientations? I have argued in the past that as Mister Rogers said, "Play is the work of children." I cannot imagine any pre-school program where carefully structured "learning play" is not a large part of the school day. If you read the New York Times article, you will note that brief academic instruction periods were punctuated by longer periods of play where children were free to explore and where teachers could roam around, interacting with children and reinforcing lessons that were learned. The key, as it usually is, is balance and the fear, as it usually is, is that policy makers will read the headlines and not the more nuanced research and apply a mistaken concept of rigor on pre-school curriculum, on teachers, and most unfortunately on children. Indeed, as publicly funded pre-K expands, the division may be not between academics and play, but between programs with well-trained and well-paid teachers and those without. I could not agree more. In order to ensure that our pre-schools are finding the right balance between academics and play, we need to be sure that we are employing the best teachers available and we need to make sure that these teachers are getting the finest, best informed professional development possible. No program, no research, no policy can come close to matching what the well-informed, well-prepared teacher can provide for children in the classroom.We cannot do pre-school on the cheap just because the children are small. We cannot run pre-school, as is often the case now, with poorly trained, poorly compensated para-professionals. The answer, ultimately, is not in the false dichotomy between academics and play, but in the will of our policy makers to make sure that every child has access to teachers who are prepared to do the job well and who are compensated appropriately for it.